Whether you have battled fleas before or not, it helps to know your enemy so you can understand the best strategy to defeat them, form realistic expectations, and pick appropriate weapons. What You Can See Is Just the Tip of the Iceberg! 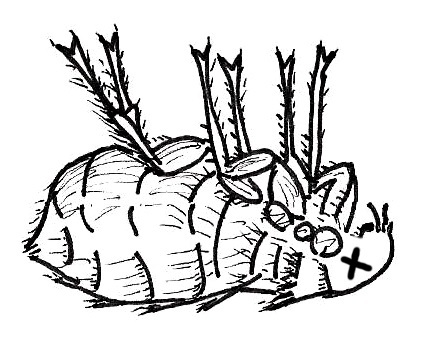 Adult Fleas: Wingless blood-sucking parasites. Live their entire 100+ day life on your pets. Flea “dirt”: Flea droppings. Little black specks that accumulate at the base of your pets’ hair. Rub onto a piece of moistened paper towel and it dissolves into the reddish-brown color of partially digested blood. 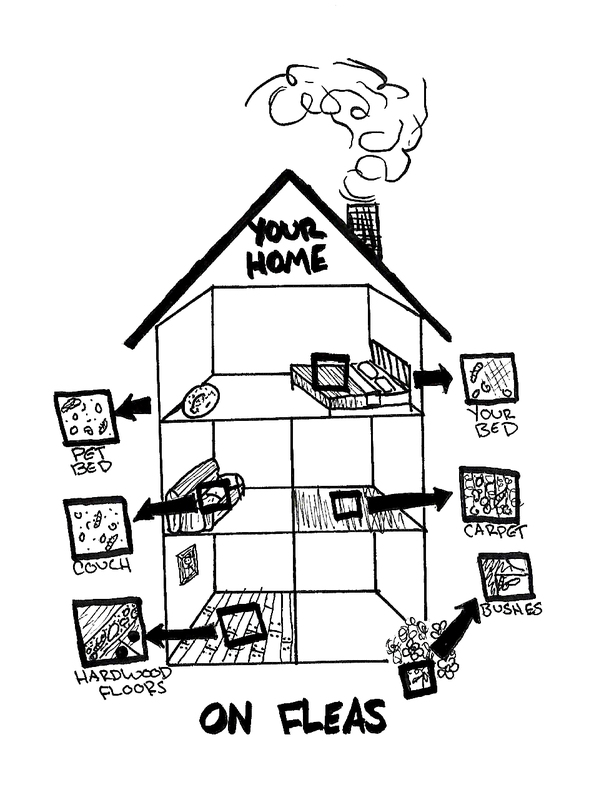 What you CAN’T See – 95% of the flea burden in your home is hidden! 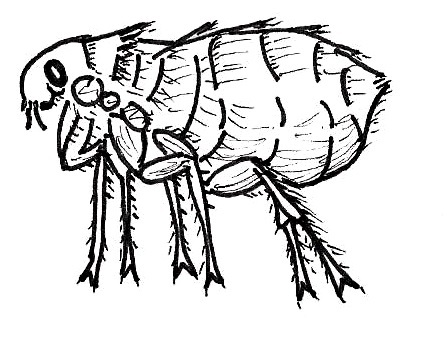 Eggs: Female fleas lay up to 50 per day. The eggs fall off of your pet so they accumulate in areas where your pets spend the most time (see flea hotspots below). 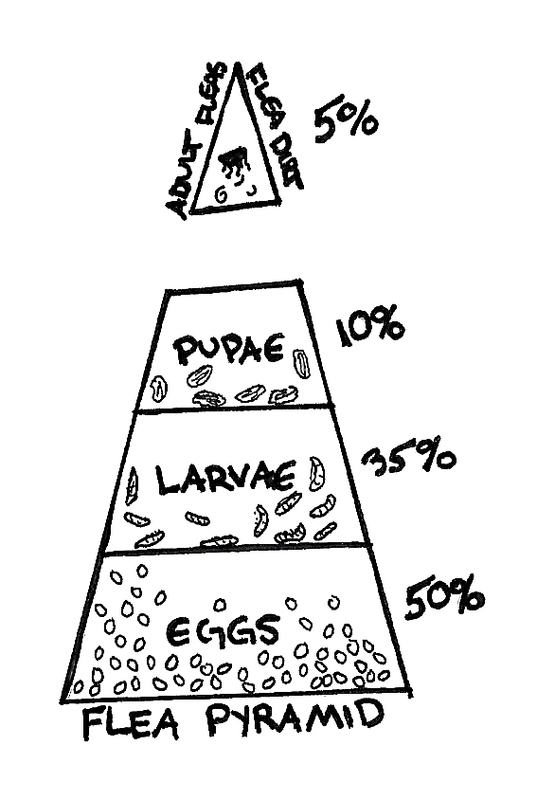 Develop into larvae within 1-2 wks. Larvae: Tiny, hairy worms that crawl deep under carpeting, under and into furniture, into floor cracks. Eventually spin a cocoon and become pupae. Pupae: Hard to destroy cocoon stage. Can remain dormant for months to years. Hatch out into adult fleas only when enough humidity and warmth present. Allow your pets to be the magnet to attract all the fleas hatching out in +/- around your home; fleas can’t reproduce without feeding on your pets. Break the life cycle by putting something in or on your pets that kills every adult flea before it can reproduce and keeps doing that until the next dose is used. Treat long enough to keep any dormant pupae that eventually hatch from re-starting a problem (for dogs this shouldn’t be an issue since we recommend tick prevention year round and most of those products protect against fleas as well). Treat the flea hotspots in and around the home environment (see below). Ask us about effective oral, topical or collar product options. Treat all animals in your home to prevent any chance of successful flea feeding and then egg laying. Treat according to directions and certainly don’t forget to treat at the correct interval. Locate flea hotspots which are the places your pets spend the most time sleeping, hiding, and playing (think in and around pet beds, your bed, the couch, cat condos, basements, etc.). They are where flea eggs accumulate. Vacuum….A LOT (every day initially), especially the hotspots. Pay attention to both carpeted (use a vacuum with a beater bar) and uncarpeted surfaces (cracks and crevices hide fleas) and in/around/under furniture. Carefully dispose of what you vacuum up (outside is best) since unhatched or hatched fleas could be present. Launder bedding from flea hotspot locations regularly. If your pets spend time outside in good flea-breeding areas (not too dry or hot) like under a deck or in a crawl space, a dog house, a car, or even a regular spot under a bush, consider using an environmental spray and/or restricting access. Try to keep stray and wild animals away (fleas may have come from them initially). Steadily fewer fleas and less flea dirt, though it can take 3 months for good initial success. Think in terms of control rather than eradication since you can never be 100% sure all the hidden juvenile flea population is gone or that re-infection from the original source of fleas outside your home won’t recur. Plan on using flea products year round to prevent a recurrence of this year’s problem.